Welcome to The Abso!ute Sound online! We explore music and the reproduction of music in the home. We believe that the sound of music, unamplified, occurring in a real space is a philosophic absolute against which we may judge the performance of devices designed to reproduce music. Our goal is to provide the resources consumers need to judge how a component's sound either honors or departs from the music's truth, and to make sound purchasing decisions that maximize their experience of reproduced sound. Below is our Issue 143, August / September 2003 table of contents and editorial. In this in-depth tutorial, Robert Harley tells you everything you always wanted to know about turntables. Our new tweaks and accessories column finds Jonathan Valin checking out the Walker Proscenium Equipment Rack, Clearaudio Matrix Record Cleaner, Silent Source interconnects, and Precision Audio Cable Elevators. Bass management isn’t only for the home-theater crowd. Gordon Holt explains why. bring you the highlights of this year's Home Entertainment show. A classic from our very first issue — Harry Pearson on The Double Advent System. Neil Gader reports on a pair of good-sounding and affordable integrated amps. Paul Seydor on new gear from two of England’s finest brands. Perreaux's latest is a thoroughly modern integrated, so says Wayne Garcia. Aaron M. Shatzman listens to a serious little two-way from Mark Levinson's Red Rose. Shane Buettner explores Balanced Audio Technology’s top preamp. What's Italian, beautiful, and highly musical? Check out Wayne Garcia's findings. The latest generation of Wilson’s classic is generating quite a buzz. Robert Harley spends some time with the Tiny Tot, and the boy’s best friend. They may be hot and heavy, but put these six glowing boxes together and Jonathan Valin says they spell one great preamp. The conclusion to last issue’s thoughts on the best of the best. 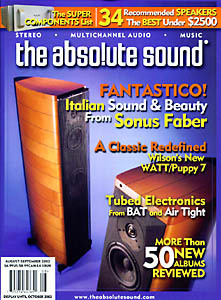 160 - Robert Harley traces the evolution of Dave Wilson's WATT loudspeaker.